At PureTech we have been gutter cleaning in Nottingham for our customers for almost 20 years. It’s one of those relatively small and simple jobs that often gets overlooked but can cause huge problems if not dealt with. Over time, and especially during Autumn and Winter when the trees are dropping their leaves, gutters can become clogged and blocked. If the debris causing the blockage isn’t removed then damage to the interior and exterior of the property can occur. Damp and water damage are common and if left unchecked these problems can cost a lot of money to repair. We use specialist high-performance gutter vacs that allow us to clean your gutters from the safety of the ground. With a reach of nearly 50 feet, we can clean most types of domestic and commercial properties without the need for ladders or expensive scaffolding. 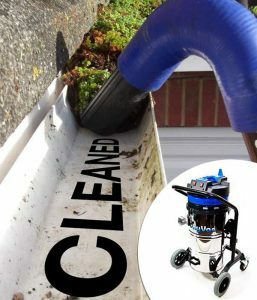 Our gutter cleaning equipment quickly and efficiently removes blockages and loose debris ensuring that your guttering is working properly. We have experience in dealing with those hard to reach areas and work on all types of properties. A simple annual gutter check-up and clean carried out by Puretech will give you peace of mind that your guttering is operating effectively. It can also potentially save you from large and avoidable repair bills in the future. 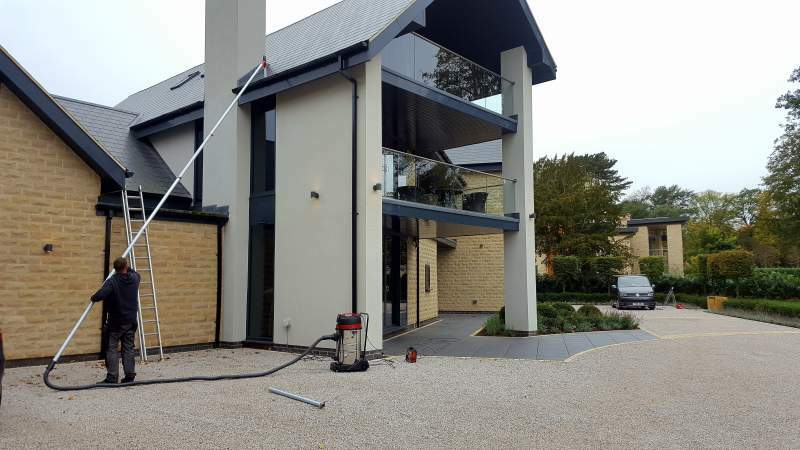 Our gutter cleaning service is used by a wide variety of business customers including retail outlets, warehouses, offices, schools and care homes. We are fully insured to work on your premises and will carry out a risk assessment before each job. For our business clients, we are happy to meet you to discuss your requirements and provide a free no obligation quote for the work to be undertaken. Our staff are professional and friendly and used to operating in environments where and our client’s customers may be present. Can you remember the last time you had your gutters checked? If not then you should seriously consider adding the task to your To Do list. Gutters are generally one of those areas of a property that is taken for granted. It’s only when something goes wrong that people tend to pay any attention to them. What many people don’t realise is that gutters have an important part to play in maintaining the structural integrity of your property. By simply keeping them clear and free of debris you are more likely to avoid expensive gutter repairs and potentially even bigger and more costly jobs! Guttering has one function of collecting rainwater and transporting it your properties drains. If well maintained and properly cleaned it performs this function extremely effectively. If gutters become clogged or damaged the rainwater that should be passing to the drains finds other routes and can leak into your property. This can cause serious structural issues and potential health problems caused by damp within the property. It doesn’t matter if your guttering is made of cast iron, pressed steel or more modern plastic. All types need to be cleaned at least once per year to ensure they are performing properly. The ideal time for gutter cleaning is the end of autumn or the start of winter. By this time of year, the majority of leaves will have fallen and the worst of the winter weather is yet to arrive. Cleaning at this point will reduce the risk of blocked guttering later in the year. It can also be a good idea to do a second quick clean in early spring to remove any debris that has been deposited in your guttering over winter. If you live in an area near a lot of trees it can be a good idea to fit a gutter guard. They help prevent leaves and other types of debris settling which stops large-scale build-up and blockages. Gutter cleaning is still needed, even with a gutter guard fitted, but they can certainly help prevent blockages and prevent larger items settling.